Quick overview 4-port Gigabit LAN interface for facilitating managed services applications; Dual Gigabit Ethernet WAN interface providing load-balancing and failover for high performance and business continuity; IPv4/IPv6 support to protect investment; 100 VPN & 50 SSL VPN tunnels for the secure remote access; Bandwidth Management with 8-level priority Inbound/Outbound QoS; Central VPN & AP Management offer easy & massive deployment; USB port supports USB temperature sensor. DrayTek Vigor 2952 series (2952N) Dual WAN serves as a VPN gateway and a central firewall for multi-site offices and tele-workers. 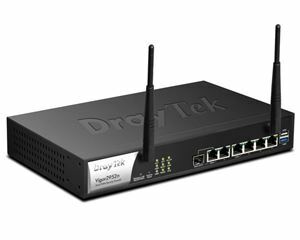 With its high data throughput of two-Gigabit Ethernet, Dual WAN, VPN trunking and 4 Gigabit Ethernet LAN ports, the device facilitates productivity of versatile business operations. To secure communications between sites is the establishment of VPN tunnels up to 100 simultaneous tunnels (including 50 SSL VPN tunnels).